On November 12, President Barack Obama announced what he called a “historic agreement” on climate change between the United States and China. The gist of the bilateral pact is that the United States has pledged to reduce greenhouse gas (GHG) emissions to 17 percent below 2005 levels by 2020, and 26 to 28 percent below these levels by 2025. China aims to cap its total GHG emissions by 2030, if not sooner. Other commitments and details of this bilateral deal can be found in David Baliol’s excellent summary in Scientific American. There are sound economic grounds for this agreement. In a paper published by the Kiel Institute for World Economy earlier this year, Johnson Gwatipedza and I show that growing trade and capital flows between the United States and China also provide a powerful incentive for cooperation on jointly reducing GHG emissions. Economists refer to this incentive as issue linkage: increasing economic ties between the U.S. and China fosters their mutual interest to negotiate a bilateral deal on GHGs. Our paper also suggests that any agreed national targets should be differentiated, which means that each country should adopt an emission reduction strategy that is suitable to its economic structure and stage of development. It therefore makes economic sense that the relatively rich United States proposes GHG limits to be achieved in 2020 and 2025, whereas an industrializing economy such as China does not start capping emissions until 2030. Unfortunately, expectations that this “step in the right direction” will turn into a signed global deal by 2015 in Paris may be a leap of faith. Instead, a more realistic path to achieving substantial and quick reductions in global GHGs might be a “2 x 4 x 20” climate change agreement. Recall the issue linkage argument. The main economic rationale underlying the U.S.-China joint pledge to reduce GHGs is that greater trade and investment between the two countries facilitate their incentive to negotiate and cooperate on such a pledge. Thus, it seems logical that the next step is to extend this two-country pledge to a four-country deal. This would be the “2 x 4” stage of a climate change agreement. The two additional partners in the four-nation agreement should be countries that also have close economic ties with the U.S. and China, are major global economies, and are responsible for a large share of global GHG emissions. The two economies that fit these criteria are the European Union and Japan. 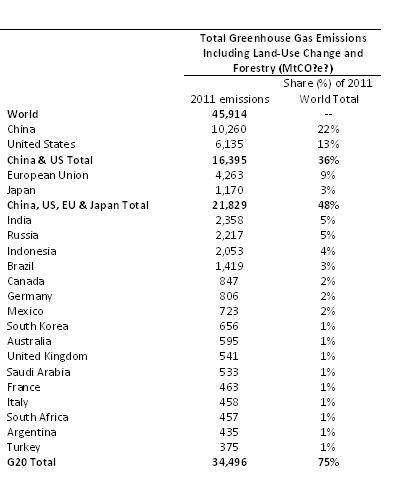 As shown in the table below, the U.S., China, EU and Japan account for around half of the world’s GHGs. Although Japan has been reluctant to announce an emission reduction strategy, as noted above, the EU has made a strong commitment to cut its GHGs. More importantly, given the increasing integration of the four economies through trade and investment, there is a strong incentive for them to negotiate on a mutual GHG reduction deal. The U.S., China and EU may just renew their existing pledges to curtail emissions, but a major contribution of the four-country agreement would be to get Japan to declare its own long-term GHG reduction policy. Also, the United States, China, EU, and Japan are leading members of the Group of 20 (G20), which is an international policy forum for the governments and central bank governors from the world’s 20 wealthiest, most populous and powerful economies in the world. According to “G20 Facts and Figures”, the G20 economies account for around 90% of the global economy, 80% of international trade, and 75% of the world population. As the table indicates, they also account for three quarters of the world’s GHG emissions. MtCO₂e‍ is million metric tons of carbon dioxide equivalent. G20 is the Group of 20 countries. The members of the G20 include 19 countries (Argentina, Australia, Brazil, Canada, China, France, Germany, India, Indonesia, Italy, Japan, Mexico, Russia, Saudi Arabia, South Africa, South Korea, Turkey, the UK and the US), plus the European Union. The G20 total excludes Germany, United Kingdom, France and Italy, as their emissions are already included in the European Union aggregate. Source: Climate Analysis Indicators Tool (CAIT) 2.0. ©2014. Washington, DC: World Resources Institute. Available online at: http://cait2.wri.org. Consequently, the third step in achieving lasting global GHG reductions is for the U.S., China, EU and Japan to lead negotiations to extend their four-country agreement to include all G20 economies. This is the final step to reach the full 2 x 4 x 20 climate change agreement. Because the G20 is already an established international policy forum for its members to negotiate and cooperate on economic issues of mutual interest and benefit, using this forum to agree common yet differentiated commitments by the twenty economies to long-term GHG reduction is a viable goal. Achieving such a 2 x 4 x 20 climate change agreement is therefore a much more realistic and logical outcome of the U.S.-China bilateral pledge than attempting a comprehensive global deal by all the world’s nations in Paris in 2015. It seems like a reasonable idea – but you forgot the politics of climate negotiations. Such an agreement would first involve China stabbing the G77 in the back by negating years worth of joint positioning work to insist that all climate change deals be negotiated by the UNFCCC. Then it would involve China somehow convincing the other developing countries that are members of the G20 (i.e. India, Brazil, Indonesia, Argentina, South Africa) that they should also go behind the backs of the rest of the G77 and scrap the UNFCCC as a venue. It would imply moving negotiations from a venue dominated by developing country interests (in numerical terms of countries participating), to one where you could at best think of there being parity between developed and developing countries (only if you classify Mexico and South Korea as developing countries, despite them not being part of the G77 block). Altogether, that may not be a very good negotiating strategy. je n’avais jamais lu un roman pareil, dÃ©puis que j’ai commencer Ã lire des romans.c’est un roman extraordinaire, ce qui m’impressionne dans ce romans c’estwangrin avec son expÃ©rience de connaitre les hommes, noir ou blanc.